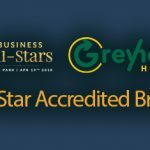 Greyhound has been accredited with an All-Star in Waste Management, we now go forward to compete in the All Ireland All-Star Enterprise Finals this week at Croke Park on April 19th. It is a huge honor to receive this accreditation. To achieve this accreditation our company was put through a robust adjudication process & this recognition is only given if a company merits it. Don’t forget to follow us online and on social media for more updates like this one as well as tips, offers, news and competitions!